The best part of visiting cat cafes is the cats (duh! ), but sometimes the humans give the kitties a run for the money, like Hadyn. It all started with a day trip to Atlanta from Nashville, which is a little crazy, but when it comes to felines, nothing can stop me. The stress of Atlanta's notorious traffic melted away as soon as we stepped in the door. The coffee area is cool and inviting with concrete floors, soft lighting and lots of wood, including a large communal table that dominates the center of the cafe. 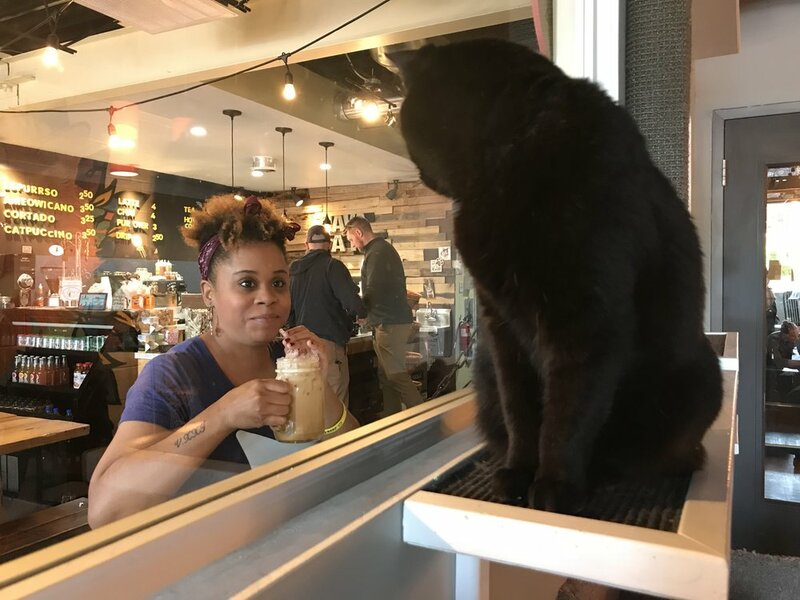 The cat room is separated by a large glass wall lined with stools if you just want to watch the cats while sipping a drink... or maybe it's the kitties that will want to watch you/your drink, as this cat lover humorously discovered. We approached the coffee bar and notified the barista that we had an appointment. Our booking of $10 per person included a cup of coffee which I selected, while my constant companion ordered a latte for a small surcharge. While the drinks were being made, we checked out the fabulous art displays by local Atlanta artist Catlanta. I took a sip of my coffee and commented on how good it was. 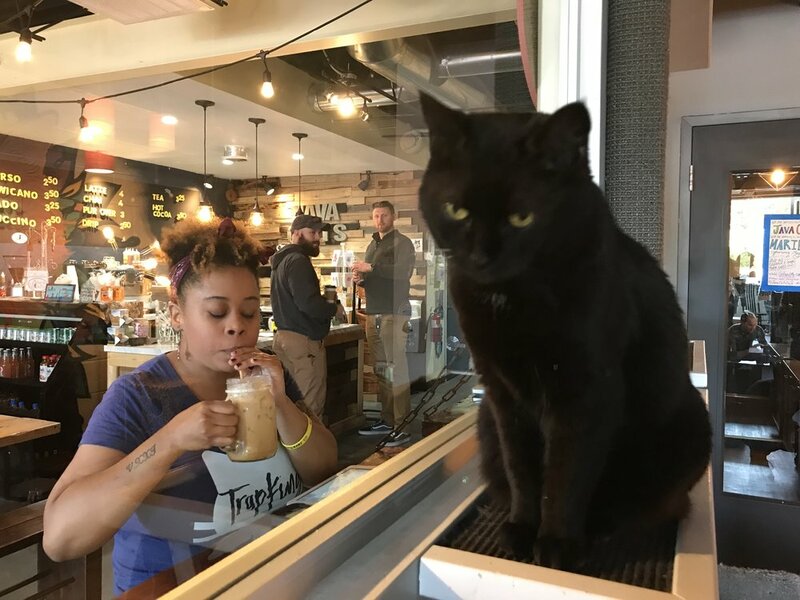 The barista explained that Java Cats prides themselves on being great not just on the cat side, but in the cafe as well. She then introduced herself as Hadyn, owner of Java Cats. Over the next hour, as we joked and laughed, it was like meeting up with an old travel buddy. Hadyn is a delight and the time flew by as we swapped stories about cats, cat cafes, travel and the challenges of being an entrepreneur. This 25 year-old former Georgia State University attendee took a big leap of faith when she left school to pursue her dream: opening Java Cats in early 2017. Despite a few setbacks (i.e. navigating the myriad of Atlanta's changing city codes), Hadyn is positive, enthusiastic and generous. 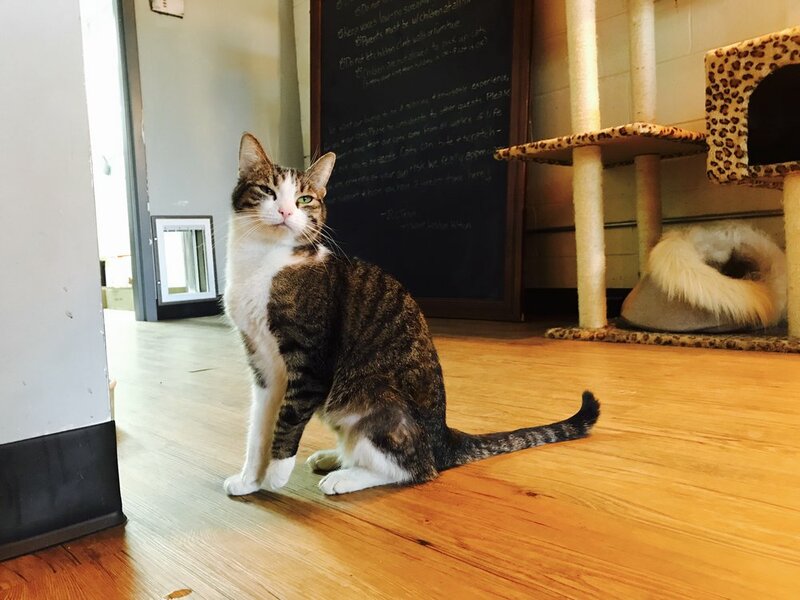 She is well-known in cat cafe circles as she has met or communicated with many owners and prospective owners to offer support and advice. She has even hosted live meet-ups to share knowledge and foster a sense of community amongst these female entrepreneurs. Moving on the to cat room, we discovered there were sixteen kitties in residence that day (they can host up twenty), some a little shy, some a little sassy. 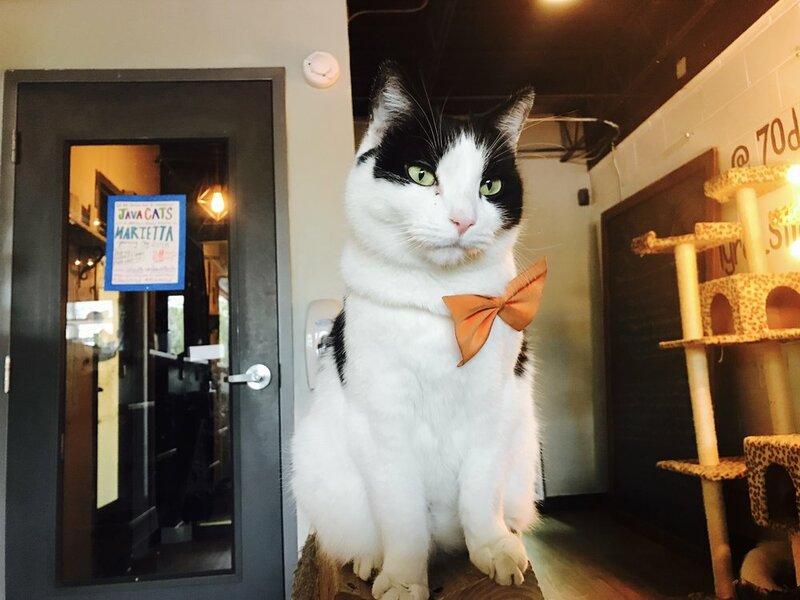 With rescue partner PAWS Atlanta, Java Cats had facilitated an outstanding 217 adoptions in its first ten months of opening which deserves a huge round of applause! Despite the prime snoozing afternoon hour, most of the felines were awake and playful, including my favorite, dapper bow-tie adorned Cabell. We enjoyed plenty of kitty fun with lots of feather chasing and head rubs. After photos with Hadyn and a few more tidbits about upcoming events such as a film festival (exiciting! ), we sadly bid our farewells, but promised to keep in touch and to return for Java Cats second location, set to open in Marietta in 2018. 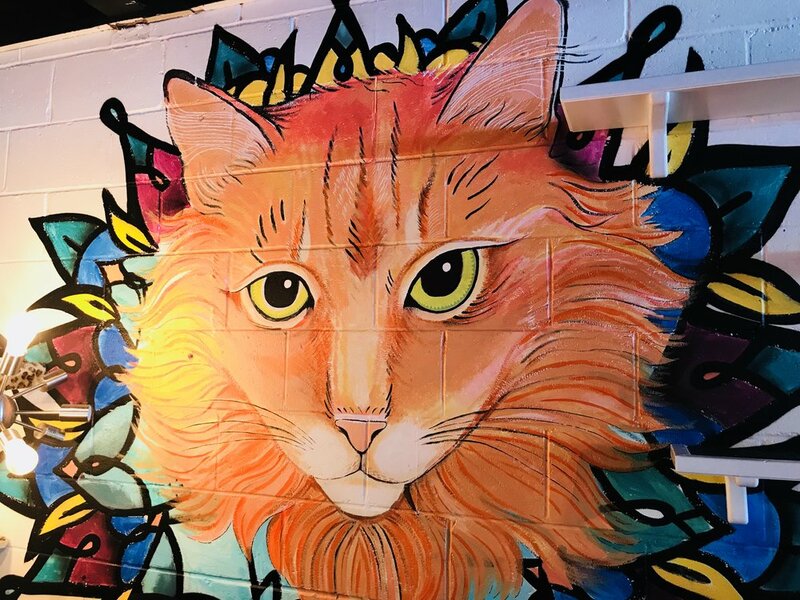 With Java Cats friendly felines, high-quality coffee and wonderfully hip vibe, it's a cat cafe that will make you want to hang for hours. 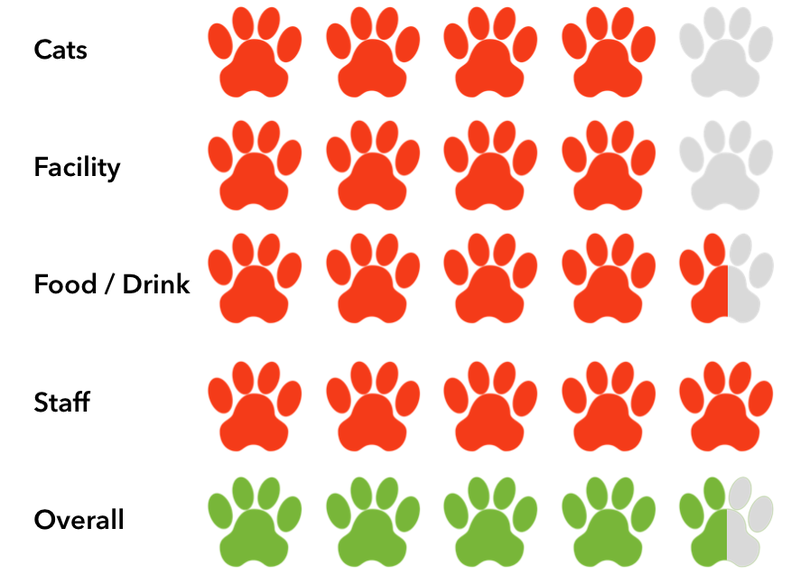 With Hadyn at the the helm, I have no doubt that a visit to Java Cats will leave you smiling.